Need to Feed the Masses? 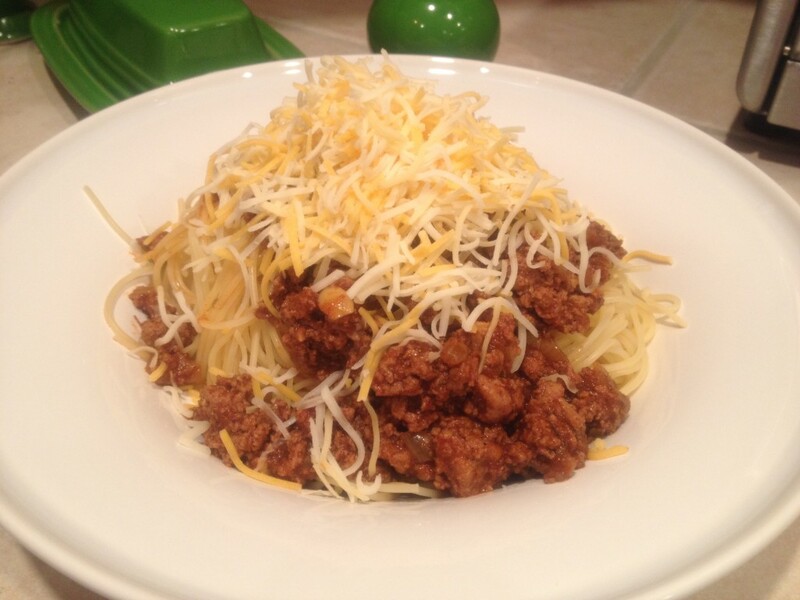 Try Cincinnati Chili! Not the prettiest dinner, but my boys devour it! This is three-way Cincinnati chili. (The recipe is in a link below, I did not re-print the recipe, since it isn’t mine). Do you have a bunch of family members visiting for the holidays? If so, may I present an easy way to feed the masses before you have to ratchet things up for the big Christmas dinner? Dave and I have accumulated favorite recipes from all of the great places we’ve been stationed. We make chicken etouffee from our time in Louisiana, kalbi ribs from our time in Korea, and Carolina-style pork BBQ sandwiches from our time in North Carolina. This is our “souvenir” recipe from our short tour in western Ohio. Unlike southwestern chili that’s spicier and chunkier, Cincinnati chili is more basic on the ingredients, very smooth-consistency, and has a distinctive cinnamon-ey flavor. The cool thing about this recipe is that you can buy the spices for the first time you make this, and you’ll have enough on hand to make this dish over and over again. Everything else is easily obtained: the meat, onions, garlic, and tomato sauce. Oyster crackers, garlic, and hot sauce are also popular toppings. There are “chili parlors” located throughout southwestern Ohio, and Dave and I had the chance to try out two popular ones: Skyline and Gold Star**. Like a Philadelphian who will have allegiances to Geno’s or Pat’s cheesesteaks, most Cincinnati natives will declare an allegiance to their favorite chili parlor. **Funny story about Gold Star chili. I was on a flight layover in Cincinnati in summer 2009. I saw a Gold Star restaurant in the airport and bought three cans of their chili for the family. Then my flight was canceled, I had to exit the airport to a hotel for the night with just my carry-on bag. The following morning, I couldn’t get those cans of chili back across security; they were confiscated. My parents shared with me their favorite Cincinnati chili recipe, from the pages of Gourmet magazine, and it’s been a favorite in our house for years. It’s supposed to be a replica of Empress Chili, which is allegedly the oldest Cincinnati chili parlor. Most of the time we substitute 3 lbs. of ground turkey for the 4 lbs. of beef, although you’ll have a more authentic flavor with the beef. Jacob enjoys helping me make this, often taking on the daunting task of sauteeing 4-5 c. of chopped onions and 3-4 lbs. of ground meat. Try setting up a “chili bar’ for the family, letting everyone serve their own pasta and chili, as well as choosing what toppings to add. A full recipe of this chili will serve six, and can be easily doubled or tripled for your holiday guests! If you choose to serve it two-, three-, or four-way, you will have even more servings per recipe, since you’re ladling less than a serving onto the bed of pasta.